It's the most heavily guarded border in the world. Land mines, razor sharp barbed wire fences and heavily armed guard posts run the 250 km (155 mile) length of the border. And yet, it's marketed as a tourist destination. I was talking yesterday with our contact at the Korean Tourism Organization. He says that a visit to the DMZ (demilitarized zone) is like nothing else you'll experience anywhere in the world. And reading about other's who have visited the area certainly makes you think that it's going to be an interesting experience. 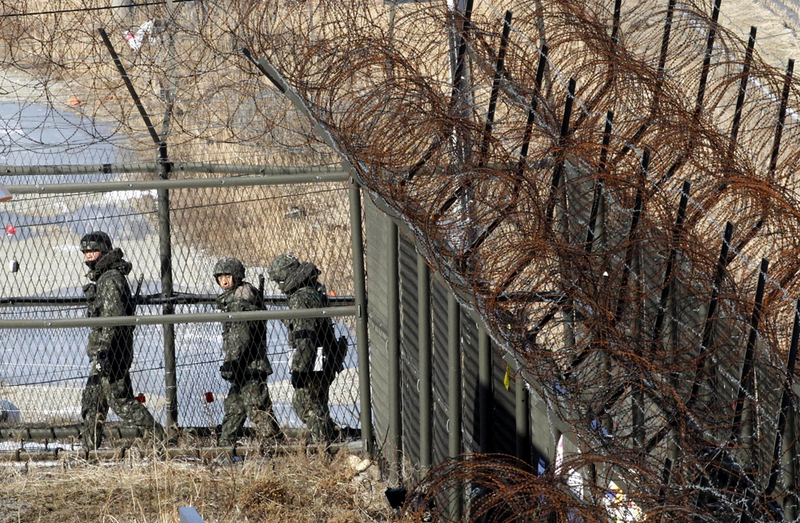 More than 500 people have died in the DMZ since the armistice was signed (most of them in the 1960's), and South Korea maintains 600,000 battle ready troops close to the border. There are also almost 30,000 U.S. troops. On the northern side, it is estimated that there are 1.1 million armed and ready, with a massive 8.2 million troops in reserve. CNN still calls it one of the most dangerous places on earth. But the odds are still on your side. The most recent incident that involved gunfire was in 2010, and more than 100,000 people visit each year without a problem. It's probably more dangerous in Chicago. And yet, we are told that you will feel the tension when you visit. And so I think we've decided that it would be worthwhile to venture out to experience a live display of unfinished history. Also if we don't ever get to visit North Korea, at least we can say that we looked at it. We drove along the fence line by a guard post when we visited in 2012, the tension was palpable even without entering the zone. That is what we have heard. We definitely think it would be an interesting tour to do. Firstly LOVE LOVE your header photo. What a great view. Do you know the name of the building which looks like a church tower? Next to the black building. Mr Sft and I went up the Shard a couple of weekends ago. It's the highest building in Western Europe and we just loved the views over London. I would definitely visit the demilitarized border zone. What an experience! In fact I would love to visit North Korea. And may do so on my list of 100 countries. I think it would be amazing!! We would also jump at the chance to go to North Korea but it is difficult to do. I believe you have to be invited, there is lots of red tape and paperwork to do and it has to be with a special organized tour. Apparently we have also heard that if you have too much of a presence on the internet you could be turned down. Thanks for the info about the building and the link, to the post. I'm looking forward to sitting with a cup of tea and reading that at the end of my long school day. Thanks for the tip about the internet. That's useful to know. Thanks you Sft, if or when we ever make it to North Korea we will keep this company in mind. I have read one blogger's post who went and visited and found it to be a very positive experience. You two are way more adventurous than we are. I don't think I would gamble on visiting the DMZ. We don't think it is that much of a gamble. If the chances of something happening were that high, then they wouldn't be offering these tours. It is probably something like our shark cage diving experience, it sounds scary but in reality it really isn't. Definitely I would go there if I had the opportunity. That is living history - and that is what real life is all about. I am excited to see your trip plans unfold! You are so right and it is part of the South Koreans life and culture and we love to immerse ourselves in local customs and culture. That DMZ visit sounds really exciting! Looking at a map, it is mindboggling how close that dangerous border is to to the 26 million people living in and around Seoul. The more we read about it the more we think we should go. It is crazy how close that border is yet these people go about their daily lives and most of them probably don't even give it a second though. Go for it! Can't wait to read the post! We'll see, it's not etched in stone yet! Yep, it would be and it would be very interesting to learn all about it in more detail. Both John and I are looking forward to reading THAT post. Can't wait! It isn't etched in stone yet but we are definitely thinking about doing it!